Most of the children’s records I’ve come across are horrible, mainly because the vocalists seem to think amusing children requires campy, cloying performances. Like the creepy hosts of children’s tv shows, they condescendingly dismiss the intuition of their audience, and confuse childlike with childish. 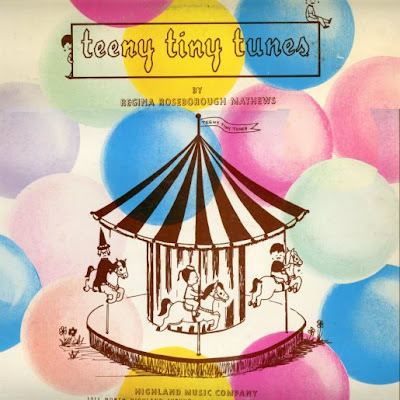 But Teeny Tiny Tunes is a refreshingly sincere, humble, and childlike record that contains some real gems. Modestly produced and geared toward very young children, this is definitely not the hip, post-flower power stuff of Sesame Street or The Banana Splits. It seems as if she probably made the record herself to facilitate musical activities in a nursery school environment - most of the songs are just piano and vocal with a few woodwinds or a cello added, which is a little sparse and eventually repetitive. However, the simplicity and brevity of the songs themselves is refreshing, particularly when spirited away from the album and nestled into a mixed CD or playlist of regular pop & rock. After years of listening to complex productions with explosive, soaring choruses, it’s rejuvenating to hear “Oh how I love to go and see the animals on the farm” as the total extent of a song’s climax. but hidden among Mathews’ candid tributes to bunnies, kittens and being reasonable while playing dress-up, there are some truly affecting lullabies with charming, nuanced vocals. 'Just For Fun,' 'The Wind,' 'The Stately Trees,' and 'Sleep My Baby Sleep' are all surprisingly sophisticated songs, with moody, poetic imagery. Though Mathews’ voice is authentic throughout the album, on these songs she’s revealed to be capable of far more personal, endearing performances than one would expect from a mere children’s record, and the poignancy of her voice is elevated even further by virtue of the fact that it is found in such an unlikely, humble setting.